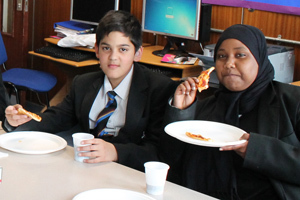 Three students were rewarded with a lunch time Pizza Party for themselves and a friend as part of a rewards scheme for excellent behaviour, working hard and being supportive of others. 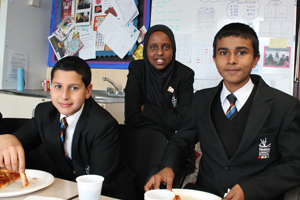 The three students (pictured right) are Zakaria (8 Blue), Nawal (7 Yellow) and Jaime (8 Blue), who all reached 40 points in the scheme and so were able to enjoy the party with a friend of their choice. Ehmandeep (8 Blue) has also reached 40 points but was away for this party and will enjoy his pizza at the next celebration. The scheme is being run by the Teaching Assistants in the HI, EAL and SEN departments. Students can be awarded 1 point a lesson and are keen to hit key targets for their rewards eg for 20 points they get a “Well done!” post card sent home and highlighting pens and a pencil case. The next target the students are aiming for before the end of term, which will get them a voucher for a meal at Nandos, is 60.